Macs are great and have been wonderful computerized partners for a lot of people. They can handle work, gaming, surfing and so much more. However, when we started using them as soon as we bought them, the speed of the Mac seemed to be much quicker, sharper, speedier, didn’t it? As we keep using our Mac, it tends to fill up and get a little slower and from there we need to take steps on how to speed it up. That’s why you are reading this how to clean up Mac without full reinstall guide right now. So let’s see what options you have available to you. Third-party Mac cleaners are often used to help get rid of unwanted items in the computer and maximize it’s usability again and among the third-party applications, we suggest using iMyMac which has a ton of options to use. As soon as you install this program you will notice that it does a ton of stuff for your Mac with the list of actions on the right side window. Using the cleanup option really helps and fits nicely in the how to clean up Mac without full reinstall guide. 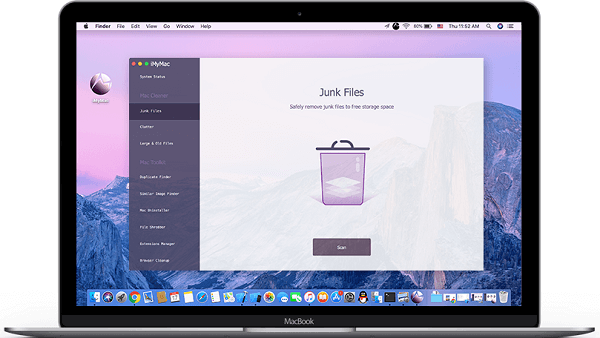 All you have to do is look for the Cleanup option and run it, it may take some time but it will get rid of so many unwanted items that you feel like you are running a brand new Mac all over again. General system junk - this can be often picked up when surfing or just using the Mac. It is just data that isn’t compiled well or is mostly clutter and will not be missed when cleaned up. iTunes junk items - You remember the last time you updated your iTunes? The older iOS and memory is still taking up some prime space on your computer and needs to be dealt with and the cleanup option will do that for you, getting rid of old iOS items that are just slowing down everything. Mail attachments - Every time you download or view attachments from emails, your Mac temporarily stores the information and keeps it around in a cache, this can really build up over time and can occupy heaps and heaps of data space that could be freed up to handle other tasks. You can imagine that cleaning it up regularly is a must if you want to run your Mac in a nice and clean manner. Finally, it cleans up so much more items that the list keeps going. Ideally, you do the cleanup rather regularly as it’s much like sweeping the floor in your home - if you don’t do it regularly the dirt tends to pile up. The only difference is if you let the dirt pile up in your home, your house doesn’t slow down, it just begins to stink. Now you know how to clean up Mac without a full reinstall which is pretty easy especially if you are using the last option. This one is the most extreme of extreme approaches. However, if you have enough money and don’t mind spending it in a whimsical manner, then feel free to take this method. Just be sure to back up your files and get ready to transfer it to the new Mac. Rest assured though, that this method usually gets a weird look here and there from colleagues or friends as no one throws away a perfectly good computer because it’s a little slower. Buying a new Mac when the old one is still fine and just needs a little tweaking is tantamount to throwing away a perfectly good sandwich because the cheese was put on the side. While this is a method on how to clean up Mac without full reinstall… technically, let’s see what other options there are that won’t earn the ire of every other computer user, yes? Not exactly part of the how to clean up Mac without a full reinstall but best to present all options available to you. There are a couple of ways to do the reinstall one is to keep most information such as usernames, network settings, etc, intact and that usually works for most people. Now there is another one that is much more extreme, it removes everything including the information above, the licenses of software, the boot drive and so much more. Before doing the latter of the two, in fact, before doing either of the two methods please backup your files. This is not a joke, back it up! When you perform a full reinstall you will lose the information you did not back up and you won’t be able to get it back. External Drive - Get an external drive, maybe one of those one terabyte drives and start dragging everything important into it. Online Storage - Places like Outbox or Google Drive are a great place to keep some files, but keep in mind space there is limited or may cost you some extra cash if you want to expand your space to store all your documents, videos, pictures and much more. iCloud - Another online backup storage dedicated to Mac or Apple users and much more, again space is limited but you can always fork up more cash in order to get more space and not to have to worry about what you backed up. Overall, this is pretty drastic and can only be advised to use when your Mac is pretty much as responsive and as thick as molasses. So as much as possible avoid this option until it is absolutely, 100% needed. So let’s keep exploring possible options for you and your Mac.